To remove stains and add to the beauty and life of your carpet use the following instructions in order. Removal of most common stains is easiest if attended to promptly. Apply cleaning materials directly to the stain. Allow to stand for ten seconds and then blot, do not wipe. Always test for color fastness on an inconspicuous spot on the carpet. Remove excess soil promptly by blotting or scraping with a dull edge first. The back edge of a butter knife works well. Do not wipe stain. Always blot gently with an absorbent clean white cloth. Mix one teaspoon of a neutral detergent, ( a mild detergent containing no alkalis or bleaches), with one cup luke warm water. Blot with clean white cloth dampened with this solution. Mix one third cup of white household vinegar with two thirds cup of water. Blot. Blot with a sponge with clean water. 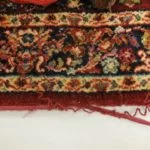 How to Determine if Your Rug Needs a General Cleaning? 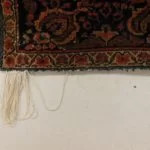 While lifting a corner of the rug, kick the back of the rug briskly. If a cloud of dust flies out of the pile, the rug is dirty and needs cleaning. If your hand becomes dirty after rubbing the pile vigorously for five to ten seconds, the rug needs cleaning. 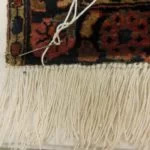 With the pile facing you, fold a part of the rug back on itself so that the pile opens along a line of knots. Look down into the pile at the foundation of the rug. 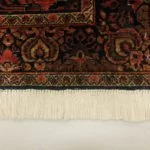 If the warp and weft look dirty, or you can see dirt deep where the vacuum can’t reach it, the rug needs cleaning. How to Find a Qualified Carpet Cleaner? Do not trust just any cleaner with your fine rugs. In order to find a qualified expert you can try several approaches. 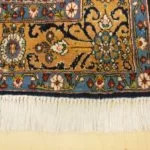 If there is a dealer of fine oriental carpets in your area inquire as to who they recommend to their customers. You can approach a museum and inquire about who they trust. 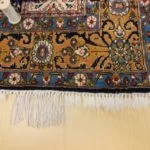 You can find a carpet cleaner through the “Yellow Pages” or the Search Goole internet, but always ask for references and take the time to call several past customers to see if they were satisfied. 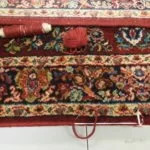 Please Feel fee To Call us For Services, We arrange the Pickup and Drop Services For your Convinence of Your Carpet or Rug From your Home, Office etc and Give you the Spot Pricing, If You are Located In Bangalore. Address: No.7, Suryodai Complex Old Airport Rd. Kodihalli, Opp Hotel Leela Palace , Bangalore India 560008, India.